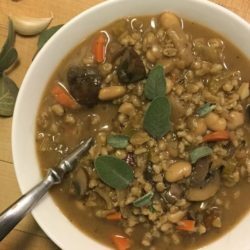 Whether for a big salad for supper, a lovely lunch, or a Thanksgiving side, this dish has all the color and flavor you want in an autumn dish. 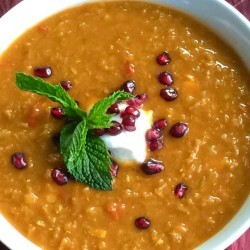 Beautiful, nutritious, and delicious! Autumn abounds with hearty greens, lively herbs, crisp apples and pears, and squashes of all shapes and sizes. Here in Boston we’re also lucky enough to be seeing the final crop of sweet tomatoes and summer corn. It truly is a cornucopia of goodness at the local farmers’ markets, which makes for terrific eating that’s good for you and the planet, too. 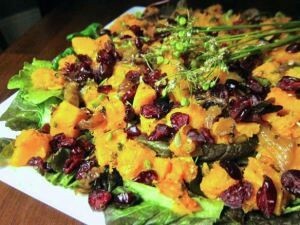 Today’s salad features roasted butternut squash, rosemary onions, and dried cranberries. The salad sings with a zesty maple Dijon vinaigrette. Watch the video of me whipping it up at the Boston Local Food Festival and learn more about why salad dressing and nuts are so nutritious. Make the dressing. While the vegetables are roasting, whisk Dijon, vinegar, and garlic together in a small bowl then stream in the oil until emulsified. I recommend adding about 4 tablespoons of oil and go from there; some people like a dressing with more vinegary zing while others prefer a milder taste. You can’t go back, so tasting is key before adding it all! Whisk in fresh thyme and season with salt and pepper. Set aside. Put it together. When vegetables have cooled somewhat to warm or room temperature, you are ready to plate your salad. On a large serving platter, create a bed of greens that makes you happy. 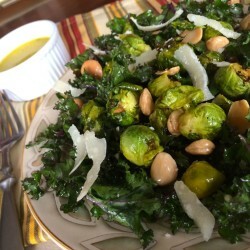 I encourage you to go for dark green and red for the greatest nutrition; the bitter crunch of kale or mustard greens works wonderfully to provide texture and contrast to the sweetness of the squash and cranberries. Spoon the squash over the greens then scatter with the roasted onions and dried cranberries. Drizzle with the vinaigrette and top with minced chive blossoms; regular chives work fine if you can’t find them. Let people serve themselves, and pass additional vinaigrette around the table. Options. For a heartier salad, include nuts and seeds of your choosing, like toasted walnuts or spicy-sweet pumpkin seeds; a whole grain like quinoa, farro, or brown rice; or cooked beans. Crumbled goat or blue cheese also work really well. Less is more, so don’t add all of these at the same time, but with tasty toppings like these you can make this salad over and over again, adding new elements to suit your mood to keep things fun and interesting. Thanks, Tom!!! 🙂 Aside from not looking straight at the camera – due to crowds and angle at the event – I do like this reel as well!! !